differing substituents at the ends of the two yne moieties. computations help explain these observations. Shown in Figure 1 are the optimized geometries and relative energies of the critical points on the reaction surface for the conversion of 1 into 2, and these results are similar with the other substituents as well. (1) Marell, D. J.; Furan, L. R.; Woods, B. P.; Lei, X.; Bendelsmith, A. J.; Cramer, C. J.; Hoye, T. R.; Kuwata, K. T. "Mechanism of the Intramolecular Hexadehydro-Diels–Alder Reaction," J. Org. Chem. 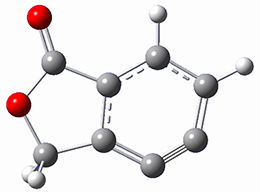 2015 ASAP, DOI: 10.1021/acs.joc.5b01356. The nature of reactions of indolynes is the subject of two recent computational/experimental studies. 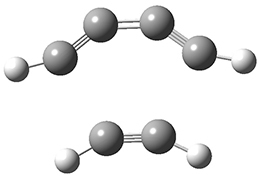 There are three isomeric indolynes 1a-c which are analogues of the more famous benzyne (which I discuss in significant detail in Chapter 4.4 of my book). One might anticipate that the indolynes undergo comparable reactions as benzyne, like Diels-Alder reactions and nucleophilic attack. In fact the indolynes do undergo these reactions, with unusual regiospecificity. For example, the reaction of the substituted 6,7-indolyne undergoes regioselective Diels-Alder cycloaddition with substituted furans (Scheme 1), but the reaction with the other indolynes gives no regioselection. 1 Note that the preferred product is the more sterically congested adduct. The authors of both papers – Chris Cramer studied the Diels-Alder chemistry and Ken Houk studied the nucleophilic reactions – employed DFT computations to examine the activation barriers leading to the two regioisomeric products. 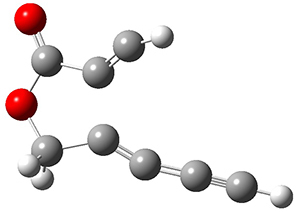 So for example, Figure 1 shows the two transition states for the reaction of 2c with 2-iso-propyl furan computed at MO6-2X/6-311+G(2df,p). The computational results are completely consistent with the experiments. 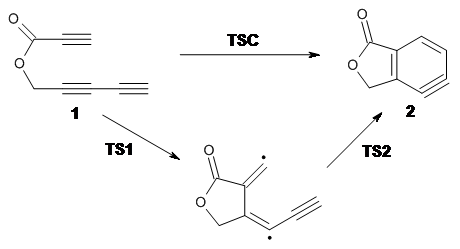 For the Diels-Alder reaction of 2-t-butylfuran with the three indolynes 2a-c, the lower computed TS always corresponds with the experimentally observed major product. The difference in the energy of the TSs leading to the two regioisomers for reaction with 2a and 2b is small (less than 1 kcal mol-1), consistent with the small selectivity. On the other hand, no barrier could be found for the reaction of 2-t-butylfuran with 2c that leads to the major product. Similar results are also obtained for the nucleophilic addition – in all cases, the experimentally observed major product corresponds with the lower computed activation barrier. So what accounts for the regioselectivity? Both papers make the same argument, though couched in slightly different terms. Houk argues in terms of distortion energy – the energy needed to distort reactants to their geometries in the TS. As seen in Figure 2, the benzyne fragment of 2a is distorted, with the C-C-C angle at C4 of 125° and at C5 of 129°. In the transition states, the angle at the point of nucleophilic attack widens. Since the angle starts out wider at C5, attack there is preferred, since less distortion is needed to achieve the geometry of the TS. Cramer argues in terms of the indolyne acting as an electrophile. Increasing substitution at the furan 2-position makes is better at stabilizing incipient positive charge that will build up there during a (very) asymmetric Diels-Alder transition state. This explains the increasing selectivity of the furan with increasing substitution. The indolyne acting as an electrophile means that the attack will lead from the center will lesser charge. In 2c, the C-C-C angle at C6 is 135.3°, while that at C7 is 117.2°. This makes C7 more carbanionic and C6 more carbocationic; therefore, the first bond made is to C6, leading to the more sterically congested product. Note that Houk’s argument applies equally well, as C6 is predistorted to the TS geometry. Cramer and Hoye have applied DFT computations to the predictions of both protons and carbon NMR chemical shifts in penam β-lactams1 using the procedure previously described in my blog post Predicting NMR chemical shifts. 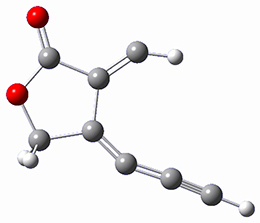 They examined the compounds 1-8 by optimizing low energy conformers at B3LYP/6-31G(d) with IEFPCM (solvent=chloroform). 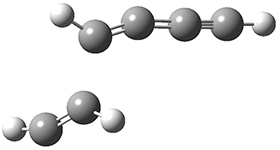 The chemical shifts were then computed using these geometries with the larger 6-311+G(2d,p) basis set and four different functionals: B3LYP, PBE1 and the two specific functionals designed to produce proton and carbon chemical shifts: WP04 and WC04. A number of interesting results are reported. First, all three functionals do a fine job in predicting the proton chemical shifts of 1-8, with WP04 slightly better than the other two.On the other hand, all three methods fail to predict the carbon chemical shifts of 1-3, though B3LYP and PBE1 do correctly identify 5-8. The failure of WC04 is surprising, especially since dimethyl disulfide was used in the training set. They also noted that WP04 using just the minimum energy conformation (as opposed to a Boltzmann averaged chemical shift sampled from many low energy conformers) did correctly identify lactams 1-4. This is helped by the fact that the lowest energy conformer constituted anywhere form 37% to 68% of the energy-weighted population. (1) Wiitala, K. W.; Cramer, C. J.; Hoye, T. R., “Comparison of various density functional methods for distinguishing stereoisomers based on computed 1H or 13C NMR chemical shifts using diastereomeric penam ?-lactams as a test set,” Mag. Reson. Chem., 2007, 45, 819-829, DOI: 10.1002/mrc.2045. Another three applications of computed NMR chemical shifts towards structure identification have appeared, dealing with carbohydrates and natural products. The approach they take was first to optimize the six different conformations for each diastereomer including solvent (chloroform). 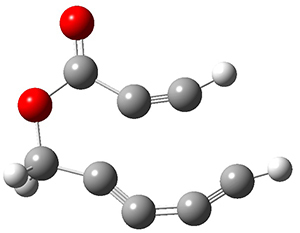 They chose to optimize the structures at B3LYP/6-311+G(2d,p) with PCM. The six conformers (notice the axial/equatorial relationships, along with the position of the alcohol hydrogen) of 1c are presented in Figure 1. Chemical shifts were then obtained with a number of different methods, weighting them according to a Boltzmann distribution. Figure 1. 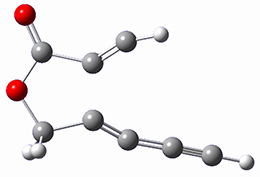 PCM/B3LYP/6-311+G(2d,p) optimized structures of the conformers of 1c. Relative energies (kcal mol-1) are listed for each isomer. where the Ps are parameters to be fit and Ex(HF) is the Hartree-Fock exchange energy, ΔEx(B) is the Becke gradient correction to the local spin-density approximation (LSDA), Ex(LSDA) is the exchange energy, ΔEc(LYP) is the Lee-Yang-Parr correction to the LSDA correlation energy, and Ec(LSDA) is the LSDA correlation energy. Chemical shifts were computed for proton and carbon, and the parameters P were adjusted (between 0 and 1) to minimize the error in the predicted chemical shifts from the experimental values. A total of 43 different molecules were used for this fitting procedure. The values of the parameters are given for the carbon functional (WC04), the proton functional (WP04) and B3LYP (as a reference) in Table 1. Note that there is substantial difference in the values of the parameter among these three different functionals. Table 1. Values of the parameters P for the functionals WC04, WP04, and B3LYP. Now, the computed proton and carbon chemical shifts using 4 different functions (B3LYP, PBE1, MP04, and WC04) for 1-3 were compared with the experiment values. This comparison was made in a number of different ways, but perhaps most compellingly by looking at the correlation coefficient of the computed shifts compared with the experimental shifts. This was done for each diastereomer, i.e. the computed shifts for 2c and 2t were compared with the experimental shifts of both 2c and 2t. If the functional works well, the correlation between the computed and experimental chemical shifts of 2c (and 2t) should be near unity, while the correlation between the computed shifts of 2c and the experimental shifts of 2t should be dramatically smaller than one. This is in fact the case for all three functionals. The results are shown in Table 2 for B3LYP and WP04, with the later performing slightly better. The results for the carbon shifts are less satisfactory; the correlation coefficients are roughly the same for all comparisons with B3LYP and PBE1, and WC04 is only slightly improved. Nonetheless, the study clearly demonstrates the ability of DFT-computed proton chemical shifts to discriminate between diasteromers. aPCM/B3LYP/6-311+G(2d,p)//PCM/ B3LYP/6-31G(d) in regular type and PCM/WP04/6-311+G(2d,p)//PCM/ B3LYP/6-31G(d) in italic type. Relative energy (kcal mol-1) of the most favorable conformer of each diastereomer is given in parenthesis. Bagno has a long-standing interest in ab initio prediction of NMR. 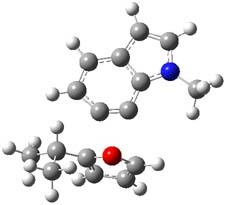 In a recent article, his group takes on the prediction of a number of complex natural products.3 As a benchmark, they first calculated the NMR spectra of strychnine (4) and compare it with its experimental spectrum. The optimized PBE1PBE/6-31G(d,p) geometry of 4 is drawn in Figure 2. The correlation between the computed NMR chemical shifts for both 1H and 13C is quite good, as seen in Table 3. The corrected mean average errors are all very small, but Bagno does point out that four pairs of proton chemical shifts and three pairs of carbon chemical shifts are misordered. (CMAE) between the computed and experiment chemical shifts of 4. 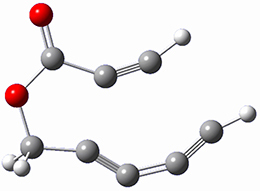 The study of the sesquiterpene carianlactone (5) demonstrates the importance of including solvent in the NMR computation. The optimized B3LYP/6-31G(d,p) geometry of 5 is shown in Figure 3, and the results of the comparison of the computed and experimental chemical are listed in Table 4. The correlation coefficient is unacceptable when the x-ray structure is used. The agreement improves when the gas phase optimized geometry is employed, but the coefficient is still too far from unity. However, optimization using PCM (with the solvent as pyridine to match experiments) and then computing the NMR chemical shifts in this reaction field provides quite acceptable agreement between the computed and experimental chemical shifts. the computed and experiment chemical shifts of 5. 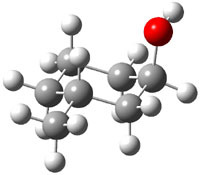 Lastly, Bagno took on the challenging structure of the natural product first identified as boletunone B (6a).4 Shortly thereafter, Steglich reinterpreted the spectrum and gave the compound the name isocyclocalopin A (6b).5 A key component of the revised structure was based on the δ 0.97 ppm signal that they assigned to a methyl above the enone group, noting that no methyl in 6a should have such a high field shift. Bagno optimized the structures of 6a and 6b at B3LYP/6-31G(d,p), shown in Figure 4. 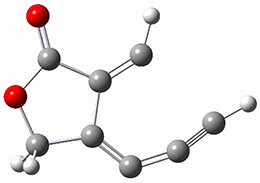 The NMR spectra for 6a and 6b were computed with PCM (modeling DMSO as the solvent). The correlation coefficients and CMAE are much better for the 6b model than for the 6a model., supporting the reassigned structure. 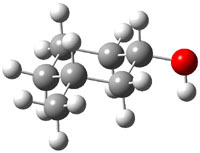 However, the computed chemical shift for the protons of the key methyl group in question are nearly identical in the two proposed structures: 1.08 ppm in 6a and 1.02 ppm in 6b. Nonetheless, the computed chemical shifts and coupling constants of 6b are a better fit with the experiment than those of 6a. Table 5. Correlation coefficient and corrected mean average error (CMAE) between the computed (B3LYP/6-31G(d,p) + PCM) and experiment chemical shifts of 6a and 6b. 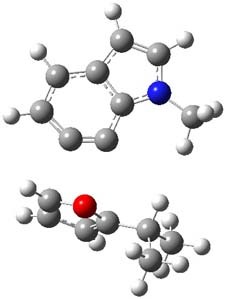 In a similar vein, Nicolaou and Frederick has examined the somewhat controversial structure of maitotxin.6 For the sake of brevity, I will not draw out the structure of maitotxin; the interested reader should check out its entry in wikipedia. 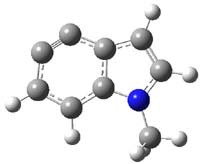 The structure of maitotoxin has been extensively studied, but in 2006, Gallimore and Spencer7 questioned the stereochemistry of the J/K ring juncture. A fragment of maitotoxin that has the previously proposed stetreochemistry is 7. Gallimore and Spencer argued for a reversed stereochemistry at this juncture (8), one that would be more consistent with the biochemical synthesis of the maitotoxin. 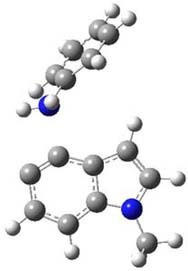 Nicolaou noted that reversing this stereochemistry would lead to other stereochemical changes in order for the structure to be consistent with the NMR spectrum. Their alternative is given as 9. Nicolaou and Freferick computed 13C NMR of the three proposed fragments 7-9 at B3LYP/6-31G*; unfortunately they do not provide the coordinates. They benchmark this method against brevetoxin B, where the average error is 1.24 ppm, but they provide no error analysis – particularly no regression so that corrected chemical shift data might be employed. The best agreement between the computed and experimental chemical shifts is for 7, with average difference of 2.01 ppm. The differences are 2.85 ppm for 8 and 2.42 ppm for 9. These computations support the original structure of maitotoxin. The Curious Wavefunction blog discusses this topic, with an emphasis on the possible biochemical implication. (5) Steglich, W.; Hellwig, V., "Revision of the Structures Assigned to the Fungal Metabolites Boletunones A and B," Org. Lett. 2004, 6, 3175-3177, DOI: 10.1021/ol048724t. (6) Nicolaou, K. C.; Frederick, M. O., "On the Structure of Maitotoxin," Angew. Chem. Int. Ed., 2007, 46, 5278-5282, DOI: 10.1002/anie.200604656. (7) Gallimore, A. R.; Spencer, J. B., "Stereochemical Uniformity in Marine Polyether Ladders – Implications for the Biosynthesis and Structure of Maitotoxin," Angew. Chem. Int. Ed. 2006, 45, 4406-4413, DOI: 10.1002/anie.200504284.